Most of the region consists of a semi-arid plain and thus appears unsuitable for developing a large and complex civilization. But the Marrah Mountains offer plentiful water, and by the 12th century the Daju people, succeeding the semi-legendary Tora culture, created the first historical attestable kingdom. They were centered in the Marrah Mountains and left records of valuable rock engravings, stone architecture and a (orally preserved) list of kings. The Tunjur replaced the Daju in the fourteenth century and the Daju established new headquarters in Abyei, Denga, Darsila and Mongo in the current Chad. The Tunjur sultans intermarried with the Fur and sultan Musa Sulayman (reigned c.1667 to c.1695) is considered[by whom?] the founder of the Keira dynasty. 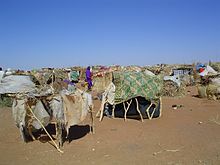 Darfur became a great power of the Sahel under the Keira dynasty, expanding its borders as far east as the Atbarah River and attracting immigrants from Bornu and Bagirmi. 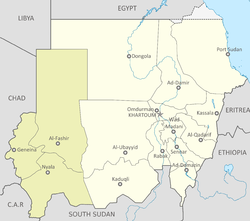 During the mid-18th century conflict between rival factions wracked the country, and external war pitted Darfur against Sennar and Wadai. In 1875, the weakened kingdom was destroyed by the Egyptian ruler set up in Khartoum, largely through the machinations of Sebehr Rahma, a slave-trader, who was competing with the dar over access to ivory in Bahr el Ghazal to the south of Darfur. While nearly two-thirds of the population continues to struggle to survive in remote villages, the international community has largely overlooked their needs, and in the face of soaring inflation in Sudan many families face serious difficulties. Virtually no foreigners visit the region because of the fear of kidnapping, and only some non-governmental organizations continue to provide long-term grass-roots assistance. As of 2015[update] the United Nations is in discussion with the Government of Sudan over the withdrawal of UNAMID, the peacekeeping force, which is the largest in the world. Its prospective withdrawal and that of other UN agencies (such as the WFP) which are already working on their exit strategies from the region is likely[original research?] to impact on the already beleaguered communities.